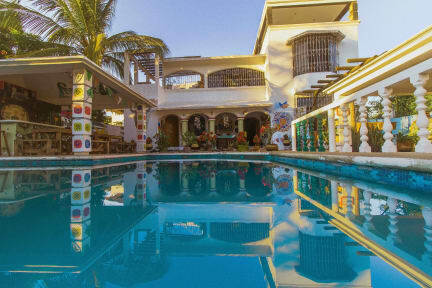 Vivo Escondido Hostel i Puerto Escondido, Mexico: Bestill nå! If you can get a room at this hostel go for it! Great location less than 5 mins from beach. This hostel is amazing! You could hang there all day & we often did! Pool honesty bar & hammocks on the roof & a delicious breakfast cooked up every day! The staff really make the place great! It is ran by some cool as ** people who are mega friendly & really care! Lots of things organised like free yoga, pot lucks, bbqs and salsa night's. We extended our stay & others did too! Best hostel in Mexico! !